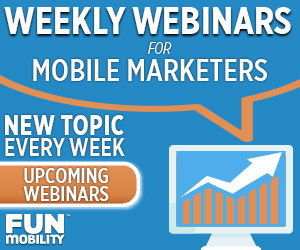 Watch our latest Fun U video: Sending Mobile Coupons with SMS by Dan Schweibold. Traditionally SMS has been the first mobile marketing tool that software companies push on marketers. Many claim it’s a must-have in marketing; if you’re not doing SMS marketing, then you’re losing money. The stats certainly back that claim. What don’t get much attention are the myriad pain points that come with SMS marketing. Without a well-executed plan, SMS marketing lists can have very high attrition rates. Maybe your consumers aren’t seeing what they signed up for, or they’re just not getting the type of content they need from your brand. So they unsubscribe. Then there are the FCC’s TCPA regulations that you need to adhere to when launching any SMS marketing campaign, lest you want to be fined $1500 per message sent. The “build it and they will come” mantra doesn’t work with SMS. If you launch a SMS marketing campaign, you’ll find that just because you built it doesn’t mean they will come, or at least not until you start advertising and promoting the new campaign. Even then, SMS marketing that doesn’t include meaningful and engaging content ends up looking like spam, and often leads to the recipient opting out of receiving future marketing messages. Trying to make a sale through SMS marketing is bound to fail as well. Any call to action that asks the recipient to make a purchase must give them a strong incentive to do so. One of the more effective SMS marketing practices is to send mobile only promotion, like a mobile coupon, that adds value for the consumer. Any SMS campaigns that doesn’t include a value add offer is doomed to fail. The only question left to ask: Is my offer valuable enough and engaging enough? With a 98% open rate, you don’t have to worry about your recipients not seeing the offer. The success of the campaign will dependent more on the value added to the recipient. For example, a typical mobile coupon has a 10% rate of redemption. Though that’s 10x the rate of paper coupon redemption, it still pales in comparison to the 49% and 80% redemption rates achieved by certain retailers. What was their secret? They sent mobile coupons offering steep discounts to the customer as long as the customer made a large enough purchase. Customers redeemed the offer because of the obvious value that they couldn’t get anywhere else. The retailer won as well, as evident by the 4x increase in the average customer cart size. 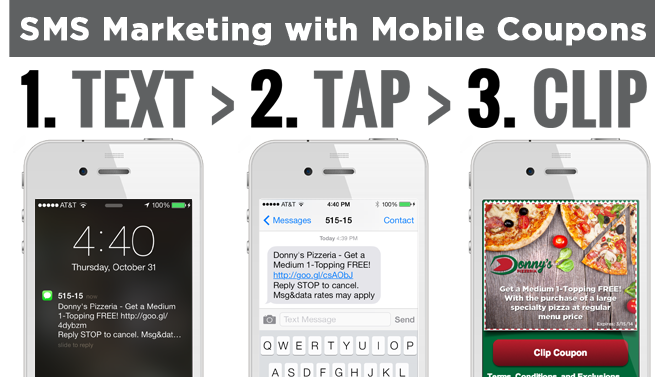 Combining mobile coupons and other mobile promotions with SMS marketing can drive sales, increase loyalty, and make sure your brand is top-of-mind with your audience. It’s important to be mindful of the value the message adds for the recipient, while ensuring that the SMS campaign doesn’t lead to a spam lawsuit like the one Viacom faced last year.